Everything is going well. As with each new beginning there is always a little time to get into a routine. But, the kids love her and she is doing a great job so far. I also wanted to reiterate how nice it was to work with you. You did a great job matching us up with Allison. She fits everything we wanted in a Nanny. I really appreciated that our budget never felt like a sticking point to find a great Nanny and you really listened to our family's needs. Thank you again. I have told at least 2 friends who are looking for Nannies about your services and plan to continue referring people to you. Thank you for the information. I received your message and will give you a call tomorrow. However, you should know that Kim is working out great. She is very efficient and Marco loves her. Of course, the real test is Giuliana and she gets excited to come home and see Kim an her baby brother. Thanks again for all of your help and reassurance. 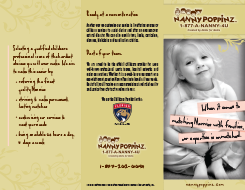 I'm so glad that I switched to Nanny Poppinz™ as you were excellent and very professional. I was writing to let you know that your Nanny was so great. She walked down to the social hour that our company was having and when the kids became restless she walked the around the resort. She also took the kids to make smoores at he hotel and entertained them in the room. She brought crafts for the kids and kept them so happy. She was firm with them when she needed but also loving. I think she was perfect for the job and will request her next time we come to San Antonio. My kids woke up in the morning and asked if she could come back. Sometimes the little ones have issues with strangers but none of them even cried. I wanted to pass along this note to you so that you could let other parents know how highly I recommend her to others and I would be happy to be a reference for Heather. My husband actually did all the calling and interactions, but he had nothing but wonderful things to say and that's not easy! We used Nanny Poppinz for baby sitters and are currently interviewing and going through trials for Nanny services, and so far are very impressed with the service and people we have interacted with. Thank you! ASIA was awesome! My daughter loved her. I am very thrilled to have found this service. We used Nanny Poppinz while we were in San Antonio taking a mini vacation. We were given Nanny Asia, and my kids really liked her. She was nice, competent (being a mother herself), asked all the right questions, and never once made me feel uncomfortable leaving my kids with her. In today's world, that's a rare feeling and so wonderful. Thank you for a great service. They were able to find me an over night Nanny last minute when my husband was rushed into emergency surgery. Nanny Poppinz made my extremely stressful situation so much easier to handle. Marie, the Nanny that came out, was prompt and curious and allowed to pay her at a later time during the day because I was unexpectedly unable to be home when I thought. My friend that met her to take over care of the kids so she could go to her day job, was unable to pay her at the time of service. So, thank you, Marie for your flexibility. I will be forever grateful. Brenda Janzen made the arrangements so easy and Candi J, lead Nanny at our event, and the 2 other Nannies, were extremely courteous and kind. They were very gentle in their approach with the children and had clear control over the room in the most positive way. Thank you to Brenda for helping me with the childcare needs for my event! I appreciate all the help!